Why should you read an article about the Best Travel Pillows 2018? Let me explain. It always amazes me that some people now view air travel as a chore. Just something they have to get out of the way before they get down to enjoying their next destination. People, listen up, human beings are simply not designed to fly – if we were we’d have wings on our freaking backs! Planes are amazing! The fact we can sit back, enjoy an in-flight meal, watch the newest Fast and Furious movie, whilst simultaneously hurtling at 800kmh through the air on the way to an amazing destination like Vietnam – it’s a bonafide miracle. But just because air travel is genuinely awe-inspiring, it doesn’t mean that everything about planes is brilliant. Of course not. Firstly there’s the shocking lack of legroom. Secondly, there’s the fact the headphone jack never works. Thirdly, whoever designs aeroplane seats must be a complete sadomasochist. Let’s face it – aeroplane seats are the single least comfortable creation ever to grace this green planet on which we live. The problem is they are built to suit the ‘average’ human. The fact is that nobody is average, so aeroplane seats suit nobody at all. So what can we do? Invest in the best pillows for travel of course. But which one is the Best Travel Pillow 2018 I hear you cry? The airports are full of the things. Well, firstly you won’t get the best travel pillow for long-haul flights at the airport. Also, you’ll save a small fortune by getting a top travel pillow online before your trip. Below are the 4 Best Travel Pillows 2018 on the market today. The Travelrest Ultimate is simply a great accessory and one of the best pillows for travel. It has a nifty flatback and asymmetrical design instead of the traditional rounded back that most travel pillows adopt. This means that your head isn’t uncomfortably pushed away from the seat and you can instead snuggle to one side back and drift off quickly to the land of dreams. The rear of the Travelrest Ultimate is covered with rubber dots that provides a good level of grip, meaning this top travel pillow is much more likely to stay in place while your sleepy head lolls from side to side. It has a handy machine washable removable velour cover which means you can clean away easily any dirt and grime you may pick up in the course of a trip. No one likes a stinky travel pillow! Not only does the Evolution Cool have, well, for want of a better word, a cool name, it is also an incredibly good looking travel accessory and one of the best-rated pillows for travelling. Of course, it’s not all about branding and looks. 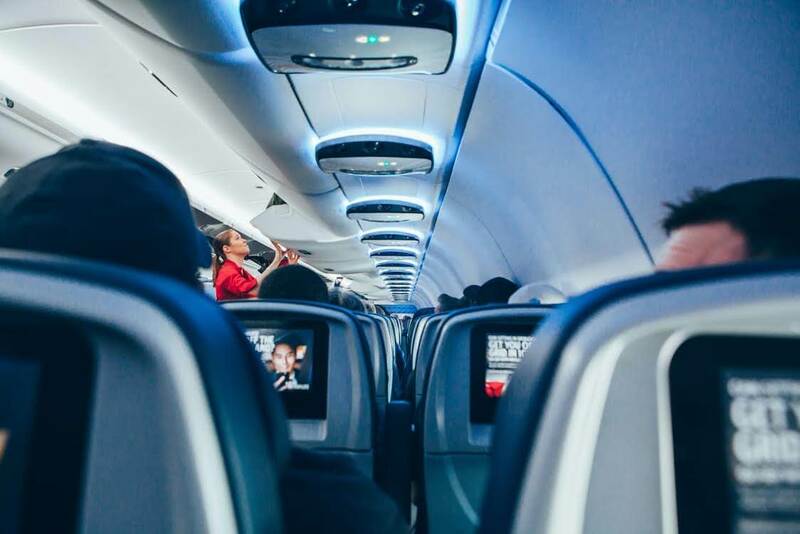 The Evolution Cool also feels great and best of all it solves one of the most annoying problems faced by many long-haul travellers – being too hot. The Evolution Cool travel pillow has a dual-density memory-foam core with innovative cooling vents that allow heat to be dispersed from the wearer. No more sweaty necks for you, my friends! The designers of this comfortable travel pillow also thought about one other persistent annoyance with normal travel pillows – headphones. Most run-of-the-mill travel pillows end up either knocking headphones off heads or squashing them painfully into ears. Not the Evolution Cool, no. This great travel pillow 2018 is designed specifically with a sweet downward curve around the ear area to allow for over-the-ear headphone use, making it another contestant for the best pillow for plane travel. If after reading this handy article you still haven’t made up your mind, then check out this even more in-depth and comprehensive buyers guide. What’s the worst thing about even the best airplane pillows? They look utterly ridiculous. There’s no escaping that fact. Most travel pillows just look silly. However, not all travel pillows are created equally. The Trtl Pillow is the travel pillow that doesn’t look like a travel pillow. It looks more like a trendy neck scarf. Which in fact, is kind of what it is. The Trtl Pillow is actually a kind of wrap scarf with an ingeniously designed inner rib that follows the contours of the wearer’s neck. It’s both flexible enough to be comfortable but rigid enough to provide support for the sleeper. What’s more, because the Trtl Pillow is predominantly fabric and not jammed full of stuffing it takes up considerably less room than most traditional travel pillows. This makes it a proper contender for best travel pillows for airplanes. TheBCOZZY has, let’s face it, a silly name. But it’s one hell of a travel pillow. Instead of adopting the usual neck brace design that most traditional travel pillows favour the BCOZZY looks more like a boa-constrictor mated with a pillow. The result is incredibly supportive and very comfortable. This makes the BCOZZY one of the best comfortable pillows for travelling. The downside to the BCOZZY, apart from the daft name, is that it is rather sizeable compared to some of the other competitors at the higher end of the travel pillow market. The upside, it is super comfortable.